Then he must figure out how to get his best friend, Cameron Frye (Alan Ruck), out of bed for the day, as Cameron is actually sick. Finally, he needs to rescue his girlfriend, Sloane Peterson (Mia Sara) from school before hatching a plot to liberate Cameron’s dad’s Ferrari and joyride through Chicago. He is supremely manipulative in all of this, toying with his parents, the school principal, Ed Rooney (Jeffrey Jones), and his own sister, Jeanie (Jennifer Grey), in order to get his way. His day out perfectly encapsulates both a teenager’s desire for freedom and extreme narcissism. 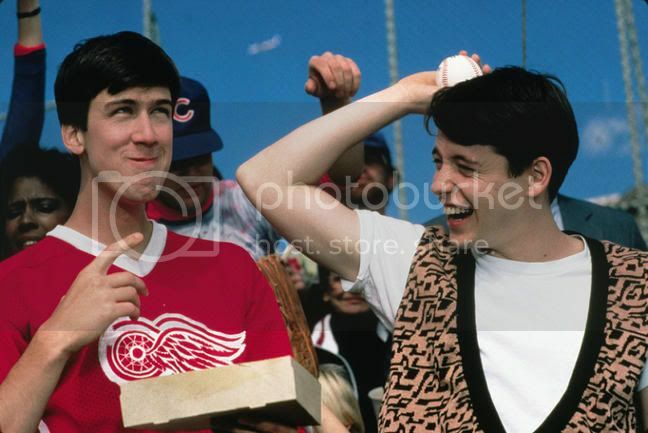 This is why, even as the audience is thrilled by Ferris’ joy rides and hookie-playing, there is a slightly worrisome undercurrent of self-absorption that flows through the picture. But this is America, that’s the way of life, right? Yet it can be a superbly guilty pleasure to watch as these kids live out our high school dreams at the expense of everyone in authority. Cameron is a more fascinating character than Ferris, in the film. Ferris is an abstract archetype, the Steve McQueen and James Bond for whom everything works out perfectly. Cameron is a self-loathing loser, who hates his parents and the life they’ve created around him. He suffers through his sickness throughout the day, and battles with his own guilt at borrowing his father’s car and a constant fear of getting caught while out on the town. 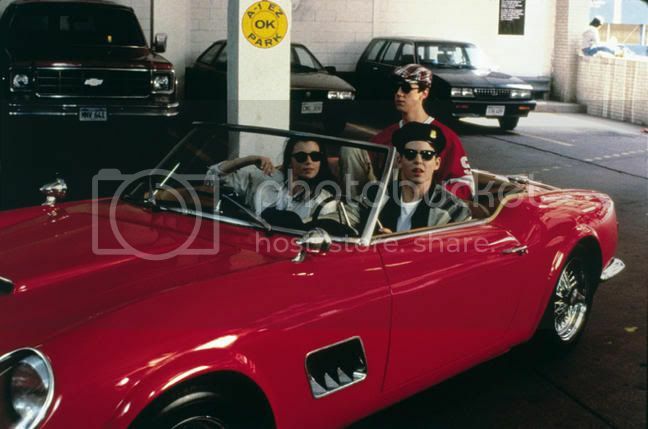 The pivotal scene involving Cameron, Ferris, and the car provides the emotional climax of the film, and a catharsis for Cameron, even as it causes the film’s pacing to stumble slightly. 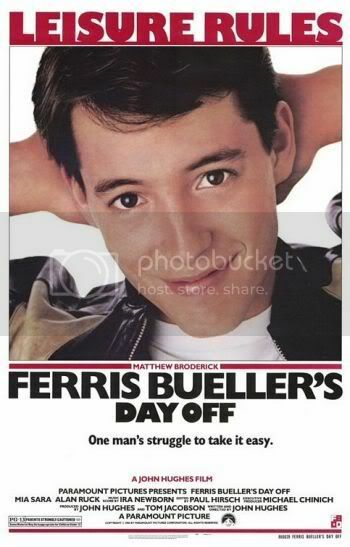 Cameron is the one whose life changes, while Ferris remains his same impish self. Jeanie is also worthy of some attention. She’s always been the good child, doing everything the right way. Yet she never receives the same attention from her parents as Ferris does, though he never deserves it. She becomes determined to undermine Ferris’ day out, and stumbles into her own trouble. She, too, experiences a catharsis, but it can only come at the hands (and lips) of a shady character (Charlie Sheen) during a visit to the local police station. This may be the teenage dream, and Ferris Bueller’s Day Off captures it perfectly, but perhaps there is a better way for a young woman to achieve catharsis? Nevertheless, the film is exceedingly enjoyable and competently crafted, ranking perhaps at the top of John Hughes’ filmography. It is nicely shot, and moves briskly aside from the aforementioned emotional scene. The soundtrack is classic, and only slightly synthesized, freeing it from the baggage associated with most soundtracks from the 1980’s. If one can manage to not worry about some of the logistical and logical difficulties associated with Ferris’ day out, there is a fine, fun film waiting for them. And, even if one can’t understand the philosophical and moral difficulties underlying much of the exposition, they will be able to truly appreciate Ferris Bueller’s Day Off. ad. People claim that your complete romantic life can be discovered by way of a single date.